Issue title: Beefalo causing crash by being on screen. Steps to reproduce: Going up to a beefalo, pretty much. 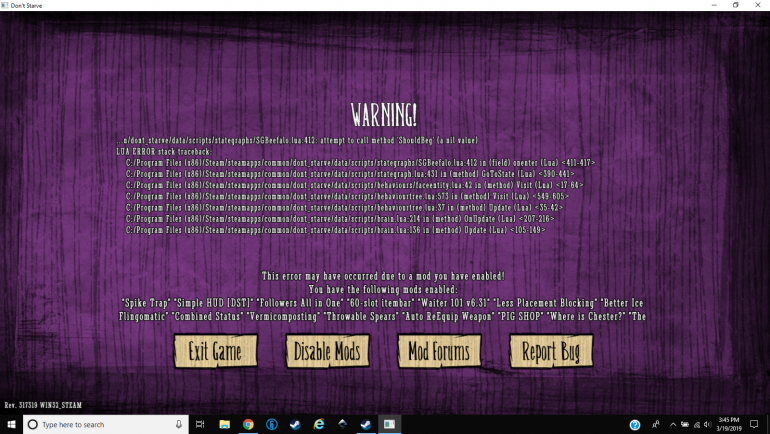 Issue description: When I go to a savanna where there are any beefalo and get close to one, after a few seconds the game crashes with the error I'm putting an image of below. I disabled all the mods and it didn't crash, so I'm going to try disabling a few at a time and going to the beefalo to see what happens. If it still happens let me know. I can't see how this bug could trigger with the code as is, but one never knows. I think I found the problem- it's catchable, combined stats, craft pot or food values. I think catchable, going to try disabling just that now. It is catchable, I disabled just that and there's no crash. In that case you might want to let the mod author know.